Morehead City, the most populous town in Carteret County, boasts a community centered around the economy and lifestyle of fishing. 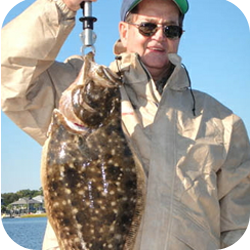 Its southern border lies on Bogue Sound, which leads directly into the Atlantic Ocean on its eastern end, providing easy access to both sound-side and ocean-side angling. The sound also connects to the Newport River and the Infracoastal Waterway, creating an inlet for passage into the sea. 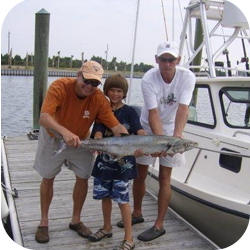 Sportfishing is huge in the area, as the Gulf Stream brings traveling schools of Mackerel, Dolphin, Tuna, and Blue Marlin to the oceans just offshore. Morehead City’s topography has significantly changed since the early 1900’s. Much of the land on the eastern shore (by the waterfront) has been claimed through dredging what was once a small strip of land lined with docks and fisheries. At one point in the early 20th Century, Morehead City’s fishing center was second only to Gloucester, Massachusetts as the busiest commercial fishing center on the East Coast. Names such as the Sanitary Fish Market, Ottis Purifoy, and Headen “Captain Bill” Ballou are still present today, their legacies lasting for generations after their beginnings. The waterfront of downtown Morehead City houses a large seaport that caters to large deep sea container ships and military vessels. This seaport came into prominence during World Wars I and II, and remains a staple of local industry to this day. Lining the commercial district of the waterfront are scores of charter fishing boats available for hire every day. Their expert captains will travel both to inner waterways as well as destinations offshore. The Morehead City Visitor’s Center is a popular spot for personally-owned boats to leave port into the Bogue Sound. From there, it is just about two miles to the Atlantic Ocean, traveling between Fort Macon and Shackleford Banks. Several marinas, including Coral Bay Marina and 70 West Marina, also service the sound, offering quick passage into the surrounding waterways.